Jericha plus plexiglass. All pictures Frank Ward 2011. All three of my classes worked with the talented and skillful Jericha this week. She has a strong background in art making, art history and dance. Check out her thoughtful blog, Splitting the Light. I’m uploading my pictures from the sessions because next week is the last week of classes and I probably will not have a chance to feature student work. I’m hoping their work will be ready for the final crit. I spend most of the studio session adjusting cameras, lights and action. The studio is a new environment for most students and it takes awhile for them to get their settings tweaked. I ask students to bring their own props. That is a big part of the fun. 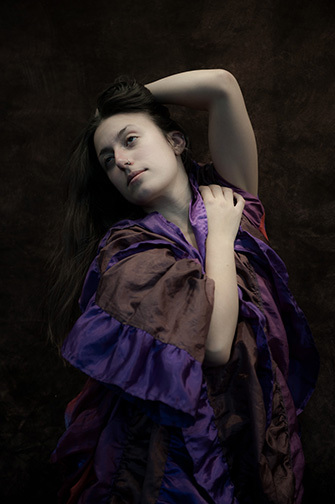 Jericha works with us doing portrait, fashion and figure. My favorite work is with projections. We take either a digital or slide projector and have the very improvisational Jericha interact with the screen. The combination of studio and model is key to transitioning students from taking pictures to making pictures. I like it when their “directorial” mode kicks in and they see the potential in adjusting the situation rather than simply recording what is offered. Reblogged this on Siobhan Callaghan.